attached anywhere. 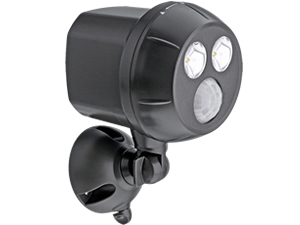 The Battery Operated PIR Spot Light has 2 bright LED's that have an impressive 300 lumen output. The unit is wireless and easy to install (no electrician needed). The PIR Spot Light has a built in photocell sensor (dusk till dawn) so the light will only trigger when the light intensity is below 3.5 lux. The PIR sensor will turn the LED lights on and off automatically, when motion is detected. The light will provide 37m of coverage with 160° of vision The light will automatically turn off after 20 seconds of no motion to conserve battery life. - Bright LEDs, 300 lumens. - Mounting hardware is provided . - LED light provides 37m² . - Battery operated 4 x D cell batteries (not included).